Next Tuesday, October 23rd, we will be releasing a new system software update for PlayStation 3 (version 4.30). 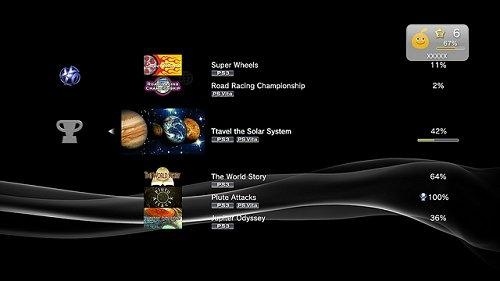 With this update we have made several changes to how Trophies are displayed on your PlayStation 3. The Trophy Collection will now reside under PlayStation Network on the XMB. Trophies that you have earned playing PlayStation Vita games are now displayed on your PlayStation 3. You will also be able to see your Trophy level and progress towards the next level while viewing your trophy collection. By the beginning of November 2012, we will retire the services available through the Life with PlayStation application. In conjunction with its retirement, we will stop offering the Life with PlayStation application to new users with the 4.30 update. This includes the conclusion of our participation with Stanford University's Folding@home, a distributed computing project aimed at understanding protein folding, misfolding and studying the causes of a variety of diseases such as Parkinson's, Alzheimer's as well as various cancers. We'd like to thank the more than 15 million users that have participated in the program since it started on PS3 in 2007. PS3 users have donated in total more than 100 million computation hours to the Folding@home project to date, and as a result, contributing greatly to Stanford University's Alzheimer 's disease research. Considering the contribution PS3 has made to the project, we decided to retire it as a result of discussions with Stanford University. "The PS3 system was a game changer for Folding@home, as it opened the door for new methods and new processors, eventually also leading to the use of GPUs. We have had numerous successes in recent years. Specifically, in a paper just published in the Journal of Medicinal Chemistry, we report on tests of predictions from earlier Folding@home simulations, and how these predictions have led to a new strategy to fight Alzheimer's disease. The next steps, now underway at Stanford, are to take this lead compound and help push it towards a viable drug. It's too early to report on our preliminary results there, but I'm very excited that the directions set out in this paper do appear to be bearing fruit in terms of a viable drug (not just a drug candidate).